PROBIST applicants will have complete research freedom. Applicants may subscribe to one or several generic research topics published with the calls. Once pre-selected they may design their research project proposal with a research group of their choice in the participating BIST centres. Successful candidates will be hosted by the selected research group. They will have full access to facilities, seminars and training programmes of the BIST centres. Networking activities shall facilitate inter-centre and inter-disciplinary exchange and collaborations. 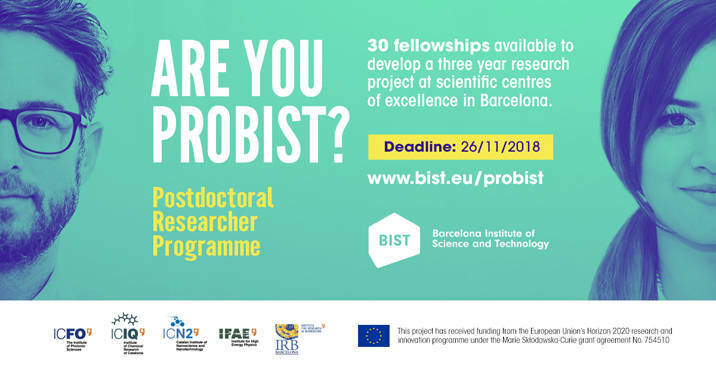 PROBIST will offer fellows the opportunity to opt for secondments from a pool of international institutions with which BIST centres have institutional agreements or collaborations. A training programme for scientific and transferable skills. A training programme for scientific and transferable skills. PROBIST fellows will receive training in leadership and entrepreneurial skills and technology transfer issues, such as industrial and intellectual property, industrial collaborations, spin-off development, and other related subjects. BIST offers 'Science to Business' courses with the goal to raise awareness of business opportunities and also to accelerate the transfer of technologies developed at the BIST centres to the market. PROBIST counts with an important number of active collaboration R&D with local and international companies and research institutions. Several BIST centres are also closely associated with major research hospitals in the Barcelona area. BIST has also established extensive collaboration agreements with major technology centres in Catalonia. PROBIST fellows will be encouraged to undertake visits and short-term stays and secondments with these partners whenever relevant to their field of research. Each BIST centre offers an internationally renowned, attractive research environment, complemented by a range of training activities that will help highly qualified young scientists to develop the skills necessary for a successful career. The high interdisciplinary nature of BIST makes it an excellent setting for fellows to access an extensive offer of scientific seminars, courses and workshops. Researcher exchange and networking programmes with key academic partners and including international conferences and workshops organised by BIST centres. In its effort to establish an outstanding long-term training programme, BIST is planning a variety of training initiatives for postdocs to support them in the different stages of their career development, by exploring the different options for becoming successful leading scientist. Along this process, fellows should acquire responsibility in conducting their own research project in a highly competitive environment (effective research, leadership skills, strategic thinking, ethical research responsibility, technical workshops), and awareness and responsibility for their own career progression. BIST is aware that training the scientific leaders of the future involves providing them with tools and aptitudes on transferable skills which will allow them to excel in both the academic and industrial worlds. The European Charter for Researchers requires that 'all researchers … are given the opportunity for professional development and for improving their employability through access to measures for the continuing development of skills and competencies'. In this regard, PROBIST will offer courses and seminars specifically designed to foster these abilities. offering tools to be active in own career progression plan. Targeted mentoring and access to a wide variety of scientific activities, services, and networks. Have close mentoring: The PROBIST research project chosen and performed by the fellow will be under the supervision of the group leader, who at the same time will be shaping, together with the fellow, a personalized career development plan (PCDP). The goal of this plan will be to develop and foster the individual competences of the fellow. The calls for candidatures will be open to everybody but special eligibility criteria and a multistep evaluation procedure will apply. There are no restrictions on gender, age, ethnic groups, national or social origin, religion or belief, sexual orientation, language, disability, political opinion, and social or economic conditions. BIST and its associated centres are committed to pro-active policies on equal opportunities and gender issues. Please review the eligibility and evaluation criteria and carefully read the instructions on how to submit an application before applying. Applications will exclusively be accepted through the online application platform. You will be informed on the state of your application at all stages. The main means of communication during the formal process will be by e-mail. The entire selection process will be managed under strict control of privacy rules. (*) the exact date of incorporation will be agreed with the host centre once the award is granted. The indicated entry dates are tentative and may be negotiated with the corresponding host centre. Please, kindly note that you can select up to 3 topics in preference order on the online application form (from the same or different host centres) but you will only be evaluated by the review panel related to the centre hosting the topic you select as 1st choice. The following partner institution are already available for undertaking secondments. The possibility of working with other partners can be explored during the fellowship. PhD date certificate: PhD certificate should be obtained before your incorporation at the research centre, at maximum May 1st 2019. If you have not obtained your PhD at the time to submit your application, please indicate the likely date and provide documental evidence that you will obtain it. Publication as first author: To have at least one publication as main author (either accepted or published) in an international reputed journal at the time of the deadline. The evaluation of eligible candidates will be carried out by an external, independent selection panel. The evaluation will be objective, independent, and free of conflicts of interest. The selection will be based on merits, equal opportunities and freedom of choice of research. Review Step 1: The selection panel is reviewing the documentation submitted with the application. The general suitability for PROBIST will be evaluated (review step 1) and pre-selected candidates will be invited to prepare a research proposal with the groups they want to be hosted at. A research proposal that is submitted needs to have the hosting commitment by the corresponding Group Leader. Presenting a research proposal is a requirement for being invited to the next review step (interview). Only candidates with an initial evaluation of 50% or higher are considered 'pre-selected' and shall pass to the next step. Scientific achievements (40%): assessed based on application material and panel interview: scientific results, references, previous research experience and skills, as well as fellowships and awards that had been obtained in the past. Scientific merit of the research proposal (30%): Scientific quality and originality of the proposal. Impact on the candidate‘s career development and prospective, as well as strategic relevance (30%): increased learning curve of the candidate; expose to new ideas and areas; interaction with different groups and centres, internationalization strategy, tech transfer (where applicable), etc. Intended re-integration of scientists after a career break is encouraged. Equal opportunities is a principle for the selection process. BIST and the participating centres aim at equal gender balance and pay special attention to candidatures coming from unfavourable conditions. Due to the large amount of applications received in previous calls, only applicants passing to subsequent evaluation steps will be informed on the progress at all stages of the process. The candidates being interviewed will receive an evaluation report for their candidature should they request it. The default means for communication is e-mail through fellows@bist.eu. The on-line submission platform for the first call will be open from October 2nd, 2018. The deadline for the submission of applications is November 26, 2018 at noon (CET). Please check the specific call parameters for detailed timelines and research topics. Before start applying, please carefully read the below instructions. Specific background information on PhD title, previous works, results, awards, etc. Upload of the PhD certificate or substituting document issued by the corresponding University or evidence on expected date for submission. The cover letter addresses research interests and motivation for the application, as well as the applicant‘s background and suitability for the fellowship. Applicants should indicate their scientific and professional trajectory and include information on publications, awards or other scientific merits. Candidates with career breaks or variations in the chronological sequence of their career steps are welcome to apply. Applications cannot be updated after the submission. Only complete applications are eligible. After the deadline, applicants will be checked for eligibility. Non-eligible applicants will be rejected. The eligible candidates will be reviewed by the selection panel. Suitable candidates will be invited to present a research proposal with the group(s) of their choice for the second review stage (pre-selected candidates). The pre-selected candidates will receive the group leader‘s contact details of the research groups of their interest. They are given 3 weeks to prepare a 2 page research proposal with the group. Candidates whose research proposals pose ethical concerns must indicate this in their proposal. In any case an ‘Ethical Issues Form‘ needs to be filled in and uploaded on the submission platform as part of the application. A research proposal that is finally submitted needs to have the hosting commitment of the corresponding group leader, in case of being finally selected. Presenting a proposal is a requirement for being invited to an interview. The candidates‘ presentations of the research proposal. As a tentative schedule, the interview will last 20 minutes plus 15 minutes of questions and answers. Successful candidates will be awarded the fellowship or put onto a reserve list according to a shortlist created by the selection panel. Candidates not passing the 70% evaluation threshold will be rejected. Rejected candidates have the right to appeal in justified cases, like evidence of bias or conflict of interest by evaluators, evidence of failure to have reasonably followed the published evaluation procedure, factual errors by evaluators that have substantially altered the outcome of evaluation. Awardees will be offered the fellowship that they would need to accept or reject within 1 week after the offer. Accepting the offer will start the incorporation process. All personal data will be treated confidentially.